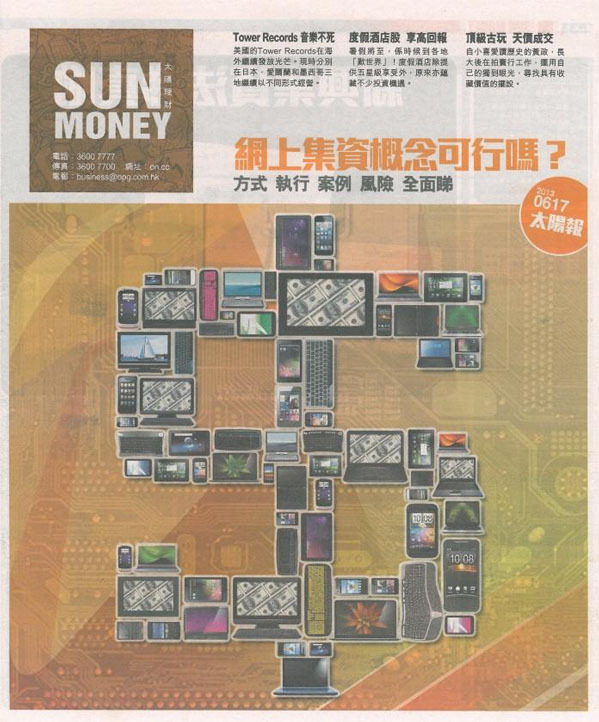 "Online Crowdfunding -- A Comprehensive Coverage of Methods, Execution, Case Studies & Risks" -- Sun Money's cover story on crowdfunding featured FringeBacker and Kickstarter, plus 2 of FringeBacker's fundraisers who have captivated media attention: David Wong ("Spy B" iPhone filmmaker) and Denis Huen (inventor of the RFID Dual-Signal Wallet for iPhone). 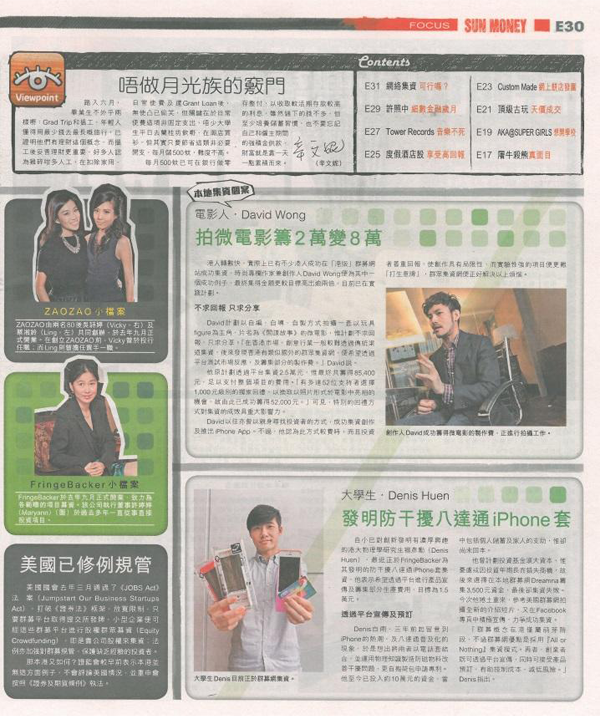 FringeBacker was invited to join in the panel discussion for Hong Kong’s very first HK WebFest on 5th-7th June 2013. This Hong Kong's first festival for web content, transmedia, branded entertainment and webseries as part of the annual Le French May. The Festival brings together content creators, producers and finance partners from around the world to discuss and explore new formats of crossplatform storytelling as well as finance structures for international co-productions. Crowdfunding in recent years is transforming the way independent filmmakers raise funds and its significance is leveling up to traditional funding structure. With thrilling panel discussions and project presentations by international industry experts, the event concentrates on encouraging local creators to produce their content with transmedia tools and production models, shaping the future of the Asian entertainment industry, continuing Hong Kong's success as a creative hub. Webseries Panel Discussion - on-the-run entertainment for mobile screens, finance & distribution strategies. Panelists includes : Michael Ajakwe, executive director LA Webfest; Marco Sparmberg, founder of HKWebFest; and Herwig Kopp, transmedia strategist NORmALUM; and Maryann Hwee, executive director of FringeBacker. 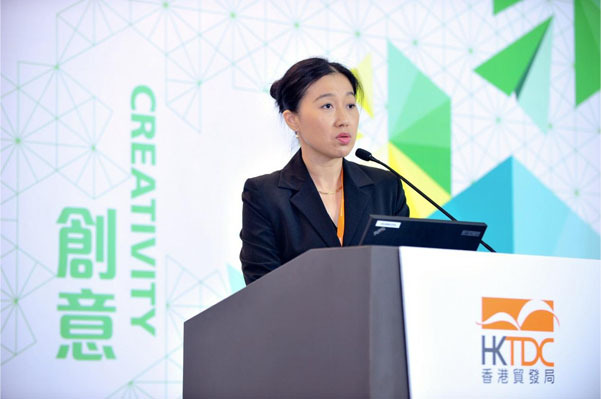 The Hong Kong Trade Development Council has been doing a fantastic job supporting Hong Kong businesses, and the Entrepreneur Day, now in its fifth edition, was another huge success. Entrepreneur Day featured more than 120 exhibitors, seminars and forums, and brought together over 13,000 entrepreneurs and potential investors and offered a wealth of start-up opportunities and support services. 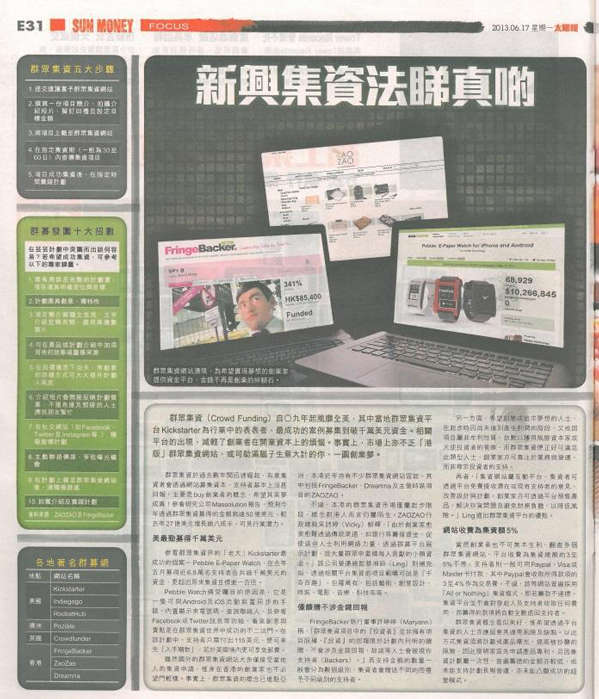 FringeBacker was thrilled to be a special part of this two-day event held at the Hong Kong Convention & Exhibition Centre. We invited a number of our crowdfunding winners to make live appearances with us to create a unique "Meet the Winners" event. Upcycling designer Agnes Nong talked to designers about how she crowdfunded her design project; iPhone film director David Wong talked to the media on how crowdfunding funded his innovative film; and Denis Huen, spoke about his patented technological invention the Dual-Signal Wallet with other young inventors. On top of that, public art illustrator Syrus Kwan shared the stage with FringeBacker and prominent entrepreneurs in talking to a packed hall about how crowdfunding made his public art project come to life. FringeBacker’s Maryann Hwee talked about how crowdfunding can help entrepreneurs raise funds for their businesses at the Entrepreneurship Seminar. Over 300 audiences were at the seminar with FringeBacker’s Maryann Hwee and illustrator Syrus Kwan sharing his success tips on crowdfunding. 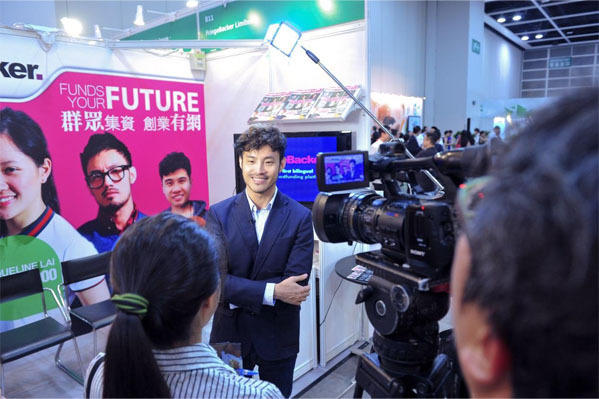 Hong Kong iPhone filmmaker David Wong was interviewed by the Trade Development Council for a video to share his experience on how crowdfunding helps independent filmmakers to fund their films.